I feel like there’s a bit of pressure to come up with a post filled with post-transplant gravitas. I should be writing about the extraordinary circumstance of having received a kidney transplant and how life has some grand new meaning. In time, perhaps. For now, I can only take a day at a time, as I took a day at a time while I was on dialysis. There’s still a lot of recovery to do. The feeling of well-being I hope to have soon is elusive for now. However, in terms of how my body is reacting to the kidney, I’m doing just fine. My body has been fooled into not rejecting this new alien organ, and that’s what we want. There is plenty of follow-up to be done for the rest of my life. My body could reject this kidney at any time– today, next week, three months from now, or ten years from now. There are dozens of restrictions and guidelines I’ve got to follow to reduce the chance of rejection, and I’m sure I’ll reference most of them in here over time, because, well, some of them are going to be annoying. I say this not because dialysis was in any way preferable to having a transplant. I’m just saying that the transplant has not been a cure. It will be an ongoing challenge to keep my working kidney in working condition for as long as possible. I’m feeling ok, generally, given what my body has been going through. There is a lot of pain from the surgical site, so I’m not moving around much. Any moving around usually needs to be followed by extensively reclining and stillness. I’ve felt the same ill effects from having had a good deal of anesthesia and painkillers that anyone who’s had major surgery knows all about. Every time I feel a little warm, I’m a little nervous, because any temperature of 100 degrees means I’ve got to call the transplant clinic, because my body may be rejecting the new kidney. And then there are the pills. 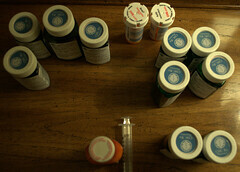 Some of these are pills I’ve been taking for awhile. Some of these I have to taken temporarily to ensure I don’t acquire virus/bacteria/fungi X, Y, or Z. 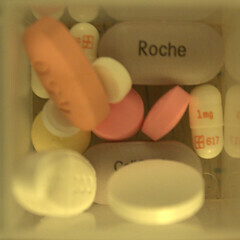 Some of these I have to take for as long as I have the kidney to ensure I don’t reject it. Miss a pill and lose the kidney is not outside them realm of possibility. So, there’s the Day 6 on My Transplanted Kidney update. I know there’s a chipperness lacking in this post that one might expect I should have right now. Remember that I’m 150 miles from home and my pets for roughly a month, and I don’t feel so well. This should all change in time. I mean, it’s really, really awesome to have a new kidney. And I’m sure I’ll write about that awesomeness more soon.